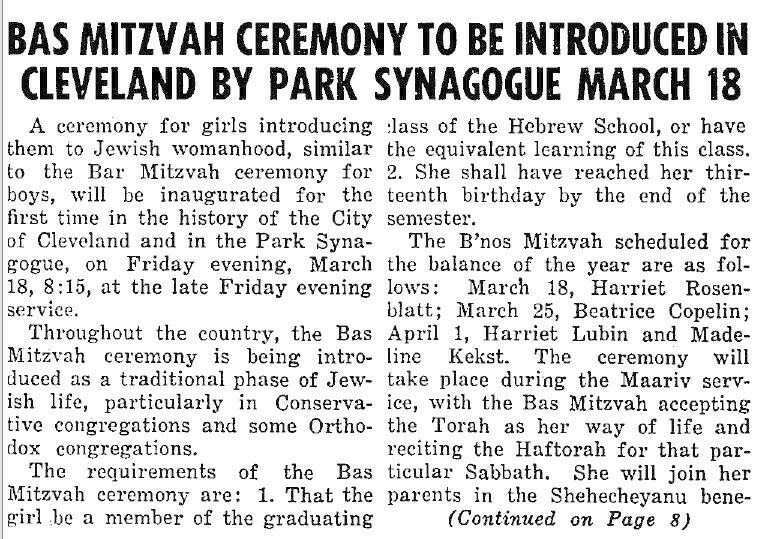 The Jewish Independent of March 11, 1949 told of Cleveland's first Bat Mitzvah to be held at Park Synagogue on Friday evening, March 18, 1949. It took exactly 27 years for the ceremony of Bat Mitzvah to make its way from New York, in the (Conservative) Society for the Advancement of Judaism, on Saturday March 18, 1922 to Cleveland on Friday March 18, 1949 at Park Synagogue (Anshe Emeth Beth Tefilo). The Conservative synagogue had recently moved to Cleveland Heights from East 105th Street in Cleveland, where it had been the Cleveland Jewish Center. The Hebrew calendar dates of the two celebrations are almost identical (Adar 16 and Adar 17) as of course was the Torah portion (Ki Tisa Exodus/Shmot 30:11-34:35). This suggests that the date had been chosen with Judith Kaplan's Bat Mitzvah in mind. In another coincidence, Joshua Skoff, senior rabbi at Park Synagogue, came to the congregation in 1990 from The Society for the Advancement of Judaism.